The global automotive refinish coatings market depicts a consolidated scenario. The 5 key players in the global market, in 2015, held around 65% of the entire market. The two leading players in the world, namely Axalta Coatings Systems, LLC and PPG Industries. The top two vendors, s and together held over 40% share of the global market in the said year. Stringent rules and regulations with respect to emission of VOC from coatings, particularly in developed areas for example Europe and North America have led to a major reduction in demand for the coatings that are solvent-based coatings. The key players operating in the global automotive refinish coatings market are KANSAI PAINT CO. LTD., Akzo Nobel N.V, Nippon Paint Holdings Co. Ltd., The Sherwin-Williams Company, and Donglai Coating Technology. A recent report by Transparency Market Research (TMR) prognosticates the global automotive refinish coatings market to expand at a steady CAGR of 5.7% during the forecast rptiod 2016 and 2024. With development rate like this, in 2015, the global market was valued to be around worth of US$6.6 bn. In the end of 2024 market is foreseen to reach around worth of US$10.8 bn by 2024. On the basis of product type, the report is divide in terms of the automotive refinish coatings market into base coats, primers, clean primers, coats, fillers, and activators. One of these in 2015, base coat segment accounted for 30% key share of the entire market. The increasing ownership of used automobiles and increasing number of road accidents have resulted in the exponential rise in the global automotive refinish market in coming years. 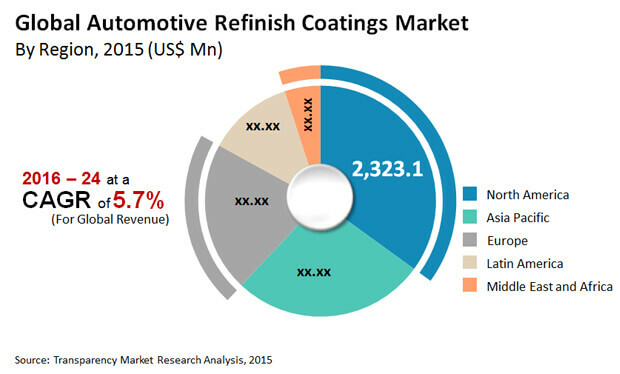 Geographically, in 2015, North America accounted for major share in global market for automotive refinish coatings market. The increasing development of the region is majorly due to increased disposable income and usual preference of the buyers to repair the machine tendency among individuals to undertake timely repairs of their vehicles. Increase in sales of automobiles over these nations is required to prompt a sizeable development of the pool of vehicles and have an immediate positive effect on the entire demand for automotive refinished coatings. Rising disposable earnings in rising economies are additionally expected to prompt a sizeable ascent in vehicle fix and support exercises, which is a major factor behind the growth of automotive refinish coatings market in developed areas, for example, Europe and North America. Efforts made by the governments and nature sustenance bodies to bring issues to light among customers in this respects have prompted a critical decrease in the generally global utilization of dissolvable based coatings in the previous couple of years. Being the overwhelming income generator of the global automotive refinish coatings market, hampered development of the section likewise specifically suggests an immense hit to the market's general development prospects. Alongside this factor, the fluctuating costs of key crude materials required for the making of automotive refinish coatings, which are for the most part gotten from unrefined petroleum and flammable gas, are additionally expected to limit the market's development to a limited degree in the coming years. These factors are estimated to boost the market for water-based refinish coatings, the item type known to have lesser effect on the nature, and achieve new advancements as far as item variety and dependability of water-borne coatings.